BVCR provides a safe haven for abandoned or abused cats and kittens until loving homes can be found for them. BVCR also provides crisis care when the room is available if a cats owner has to go into hospital, is between properties or is experiencing family problems. Little Blue really needs a new home and a break from his foster siblings. He has been living at the shelter his whole life, all 4 years! He was found as a kitten with his mum and siblings in a wall cavity, very timid and scared, with damage to his knees and hips. 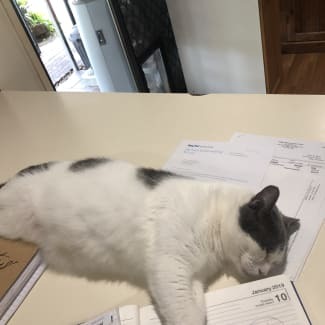 As he grew older, the advice from his vet was to remove one of his rear legs, which was done 2018. His remaining knee is not 100% but with less stress and a quiet loving home, we believe he'd live a longer and happier life. The abundance of his fellow felines in the shelter environment means he feels quite stressed most of the time. Blue really loves to cuddle up to you, such a smoocher! He presents as shy upon first meeting but doesn't take long to become a sook... he loves to play too! He's a very petite cat, with fine features and this gorgeous blue short coat. He's lived his whole life with dogs and a toddler so he'd be fine with either, if given the space for himself at times too. 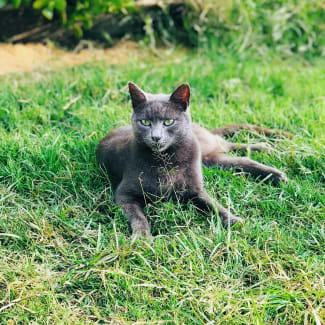 Surely someone is happy to help our tripod kitty find his own loving family... if you'd like to meet Blue, please call Tennille 0450 785 861. You want a dog, but want the independence of a cat... you get Terry. Terry is basically a dog in cat's clothing. He is super attentive and loves being around his human, following you around like a puppy and playing with his toys. He needs a family that are willing to teach him some manners and how to interact with his humans... he sometimes nips or grabs hands for attention a bit too roughly. Due to this, we'd recommend slightly older children that aren't too sensitive. He's currently living with a 4 year old and is learning what's acceptable behaviour, but would need his new family to continue this. Tez is great with larger dogs and ties to engage and groom them but he can tend to be too rough for little dogs and beats them up! We see him as the only cat as he's quite dominant and would need outdoor safe day access. He has some skin irritations that the vet says are anxiety caused, so being an only cat with lots of love will be his saviour. Tez has had all his vet work completed, including Entropian Surgery (basically an eye lifts as his eyelashes had turned in). He's been at the shelter for approximately 10 months as vet estimates him as around 3 years old. If you'd like to meet Tez / Terry, please call Tennille on 0450 785 861. This is Sultan, we guess he's between 5-8 years old. He was rescued from the pound about 2.5 years ago and is still at the shelter awaiting his own family home. He's the type of big lovable oaf that needs some outdoor time to blow off some steam, in a safe escape-proof environment. He is 90% cat friendly but is very dominant so best either as an only cat or needs plenty of room to house his big personality. He definitely needs outdoor time but in a safe environment as his confidence could see him wandering the neighbourhood, causing a ruckus. He's good with dogs and seems tolerant of little kids. He's such a character and follows you around like a dog during the day and sleep with you at night. He will have a full dental prior to rehoming and has had all his other relevant vet work (desexing, worming, flea treatment and vaccinations). 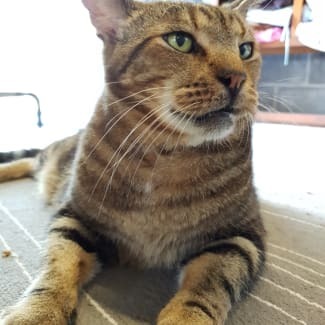 If you'd like to meet Sultan, please call Tennille 0450 785 861. Romeo is a loving cat who just wants to be with you. He'll cuddle all day long given half a chance. He gets on well with other cats and with dogs. This boy really deserves a loving secure home of his very own. 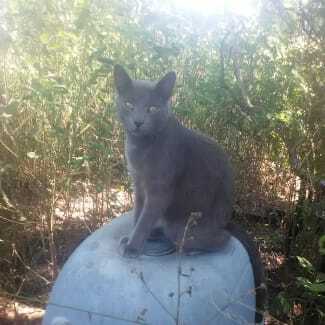 Maurie is a Russian Blue. 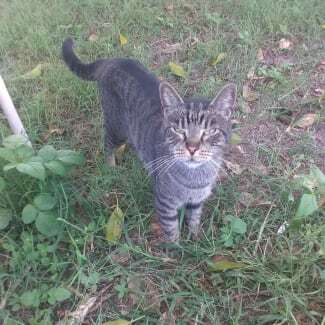 He has a sweet nature and can be shy to begin with but is absolutely a cuddle bug once he gets to know you. He gets on well with other cats but would be best suited with a younger female cat if there is already one in the household.